Miami Trace’s Lena Steele (19) advances the ball between two players from Sheridan during a Division II Sectional semifinal match at Miami Trace High School Tuesday, Oct. 16, 2018. 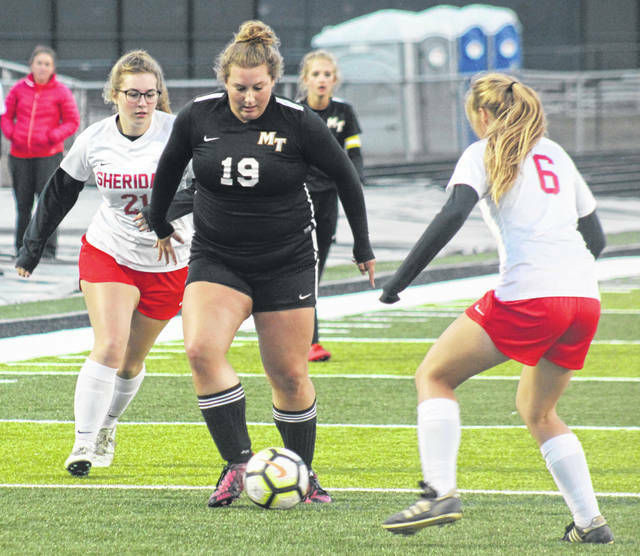 The Miami Trace Lady Panthers opened the Division II Sectional soccer tournament Tuesday, Oct. 16 with a home match against the Sheridan Generals. After a somewhat slow start, Miami Trace warmed up on this chilly evening, pumping in four goals in the final 16 minutes of the first half on their way to a 7-0 victory. The Lady Panthers, now 11-4-2, will host a Sectional championship game Saturday at 11 a.m. against the Circleville Lady Tigers. Circleville defeated the Lady Lions of Washington High School, 6-0 Tuesday. Miami Trace hosted Circleville back on Aug. 21 and won that match, 2-1. The win was the second tournament victory in as many seasons for Miami Trace and the second in the history of the program. Last year, Miami Trace beat Hillsboro, 1-0 and later fell to Chillicothe, 7-1 in the Sectional finals. It was also the Lady Panthers’ first home soccer tournament game. Miami Trace held a 4-0 lead at the halftime break. Becca Ratliff scored what turned out to be the winning goal on a penalty kick at the 15:46 mark of the first half. Macy Creamer scored with 12:51 remaining, the assist going to Ratliff. Miami Trace made it 3-0 with a second goal from Ratliff with 11:13 remaining to be played in the half. Creamer had the assist on that goal. Ratliff accomplished the hat trick (three goals in a match) with 3:56 to play. The assist went to Tori Morrison. With 33:37 left in the match, Tori Evans scored an unassisted goal. Creamer scored again with an assist from Ratliff at the 30:36 mark. Ratliff converted her fourth goal of the match with 11:55 to play. Miami Trace had 39 shots on goal to 12 for Sheridan. Khenadi Grubb had nine saves for Miami Trace. “We started off kind of slow,” Miami Trace head coach Caitlin Francis said. “Once we got the first goal, we just kind of kept rolling. We played really well and came together. In other Division II girls soccer Sectional games Tuesday, Hillsboro beat McClain, 8-1. Hillsboro will now play the No. 1 seed Unioto Saturday at 11 a.m.
Warren beat Jackson, 2-0 to advance to play the No. 1 seed in the upper part of the bracket, Fairfield Union, Saturday at 11 a.m.
Athens shut out Gallia Academy, 1-0 and will play the winner of the Waverly-Logan Elm match Saturday morning. Waverly was leading Logan Elm Tuesday, 3-0 at halftime, according to a report from the Circleville Herald. https://www.recordherald.com/wp-content/uploads/sites/27/2018/10/web1_Lena-Steele-MT-girls-soccer-vs-Sheridan-Sect-semifinal-10-16-2018.jpgMiami Trace’s Lena Steele (19) advances the ball between two players from Sheridan during a Division II Sectional semifinal match at Miami Trace High School Tuesday, Oct. 16, 2018.